Unlike desktop OS, mobile phone operating systems don’t have a recycle bin nor do they provide an Undo utility. Android OS will turn 10 next year, but it still lacks a trash bin. As the mobile phone screen is small and buttons in the Android apps are placed beside each other, a user may unintentionally tap on the button and delete an important file, contact or message. If you’re using an app to backup OS and application data, you can get back your deleted files easily. Users that have never backed up their mobile phone data can recover files with the following data recovery apps. 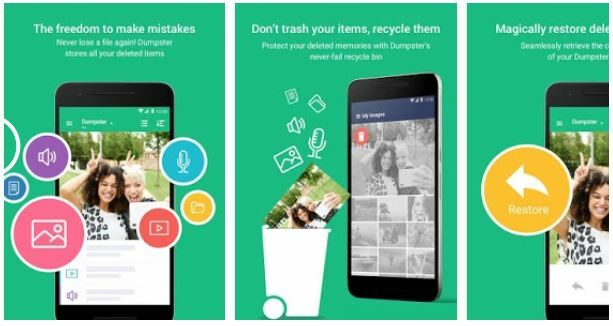 DiskDigger is a free photo recovery app which you can use to recover accidentally deleted JPG, PNG, GIF files. The app has basic features, but it works like a charm. The DiskDigger app supports 2 scanning modes, basic and full. The basic scan operation runs for a few to several minutes. It searches for files in folders which the app can access without root permissions. The other mode i.e. 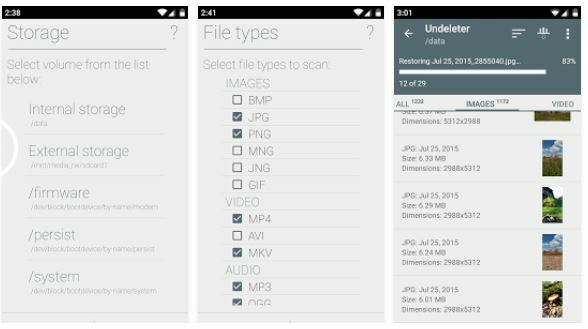 Full Scan searches for image files in every folder on your phone’s storage memory. You can configure DiskDigger to display search results as a list or grid, find files of specific size or files that were created between two dates. DiskDigger allows users to see the file location, size, and dimension of the photos. It provides an option to bulk select, restore, and delete images. 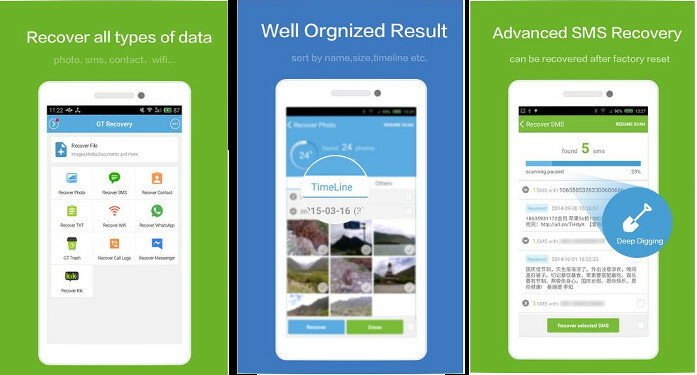 Users of this app can sort files by their creation or modification date. DD lets users restore files to local storage memory or Google Drive. UnDeleter is a powerful app which lets users recover deleted files of all types. It can also find unintentionally deleted WhatsApp conversations, call logs, and SMS on your Android device. The app requires root access to work. If you run use Undeleter on an unrooted phone, you’ll be able to recover only photos. UnDeleter enables you to sort files by their size and type. It can find files smaller than the value you specify. The app supports batch file operations. However, you cannot select all files from the list in one go. To select a file, you must tap on it. UnDeleter lets you restore deleted files to Dropbox, Google Drive or local storage memory. Location access for displaying advertisements. Storage memory access for finding accidentally deleted files. Unlike other apps that scan storage partitions to find deleted files, Dumpster runs in the background and creates a copy of files you delete. In other words, the app functions a Recycle Bin. Dumpster keeps an eye on documents, videos, pictures, APKs, VCFs, etc. By default, Dumpster will save each file user deletes. If you delete 1000 useless files, the app will create 1000 copies of the deleted files. Thereby wasting the storage memory. To make sure that this app doesn’t fill the storage memory with copies of useless files, users can configure Dumpster to automatically delete the backed up files after a week, month or 3 months. The app is easy to use and it provides different color themes. It has filters to display files of specific type. It also offers a function to sort files. 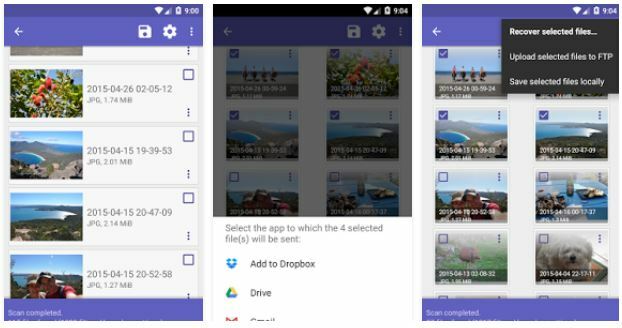 DigDeep is an image recovery app that scans the internal and external storage memory of an Android device to find traces of deleted pictures. The app doesn’t require any configuration. Its scanner gets into action immediately after the user taps on the app’s home screen icon. When the scanner completes its task, you’ll see a list recoverable images arranged in a grid interface. The button to restore images is hidden. You must tap on a picture to unhide the button. DigDeep supports batch tasks and JPG, PNG format files. It has a simple UI and doesn’t require Root access. It lacks an option to sort images and filter search results. GT Recovery is the most powerful file recovery app for Android devices. It is a lightweight application with several features. It is the only app on our list that provides a file recovery wizard. GT Recovery can display the images it has found in a timeline interface or in a list. It supports batch operations and has the option to save the scan results. GT Recovery enables you to filter images by their size. Large, medium, XLarge photos will be in excellent condition and small images will appear blurry. The GT Recovery app provides an option to securely delete photos from the phone. Hence, you can use the “Secure Erase” option to delete blurry images and free up the storage memory. Apart from pictures, you can recover deleted contacts, videos, text files, Wifi password, call logs, messages with GT-R. You can also recover the WhatsApp, Kik, Facebook messenger data with this app. The GT Recovery app features a settings panel where you’ll find an option to change the default scanning location, disable/enable call logs and turn off notifications. DiskDigger, GT-R, DigDeep, UnDeleter, and Dumpster are the best Android apps to recover deleted files.